1 Heat oil in 12-inch skillet over medium heat and cook green pepper and onion, stirring frequently, 5 minutes or until vegetables are tender. 2 Meanwhile, beat eggs, milk and Hellmann's® or Best Foods® Dijonnaise™ Creamy Dijon Mustard in medium bowl until smooth. Add ham and egg mixture to skillet and cook, stirring occasionally, 3 minutes or until eggs are set. 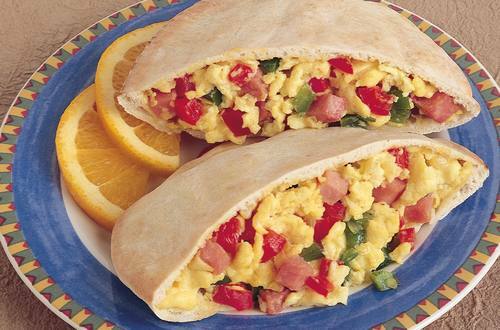 3 Spread pitas, if desired, with additional Mustard and fill with egg mixture.